New Orleans Everyone but the President seems to understand that Charlottesville was an unmitigated disaster. In the wake of the violence and its deadly impact, cities, north and south, have been reinvigorated into taking quick action to remove divisive Confederate monuments in order not to offer platforms or excuses for future Charlottesvilles. One focus has to be on how the police ended up as almost spectators letting the parties “fight it out,” rather than acting to ensure some modicum of crowd control. Surprisingly, the much maligned, and justly so, New Orleans Police Department is getting rare props for having made sure opposing sides were always separated during the long struggle to remove Confederate statuary in the city, reducing them to exchanging chants and catcalls. Other cities led by Baltimore have moved virtually overnight to get the job done and avoid conflict. What did the Charlottesville police have to say for themselves? Listen carefully, there will be questions on this test. The police said that they had talked to the organizers from the white supremacist and hater groups and had been assured that they would all be entering the park from one place. They deployed the police based on that information so were caught flatfooted and out of position to do much more than watch and try to catch up when instead the racists and neo-Nazis came swarming into Emancipation Park from several different directions. 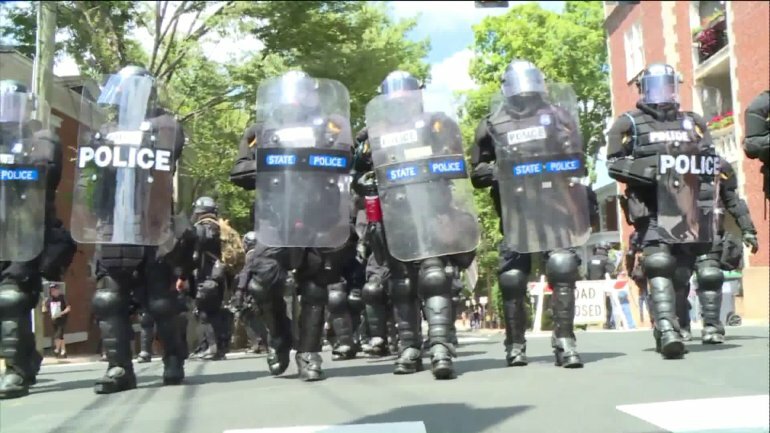 Ok, let’s concede that Charlottesville is a small city, barely beating 50,000 folks soaking wet and the cop crew of a bit more than 100 officers was vastly understaffed and more Mayberry than mob-ready, but nonetheless let me know if anyone has ever heard a lamer excuse. Rather than being prepared, the police simply took the “word” of these hater-march organizers. I’ll come back to that, but first, let me share a piece of Organizing Tradecraft 101: no organizer ever shares the exact plan for a march or rally with the police! The whole point is taking the street or whatever is available. A protest is about showing power and applying pressure. Organizers have their jobs, and they have to do them. The police have their job, and they have to do it. Every rookie organizer even on their first action knows that simple equation. We are the mouse, and they are the cat, and it is our job to roar. It is their job to be ready and draw the lines, while it is out job to push the boundaries and cross the lines. But, my point is not just that the Charlottesville police were snookered, naive, and not ready for the big leagues. More worrisome is that they were gullible because they wanted to believe the good ol’ boy haters. They believed that because these were right wingers, they would respect the police and “play fair” because despite the difference in uniforms and even races, they were brothers in belief in law and order. A protest on the left is met with horses, tanks, and police in military formation. A protest on the right is met with gloved handshakes and preparations for playing pattycake. Charlottesville is a case study of the consequences of such double standards. The police in Charlottesville were suckered because they were willing to be suckered. They forgot the basic rules that define protesters of all stripes, the police and the public. The protesters are organized to make their points and demonstrate their positions to the public. The police are supposed to protect the public. There is no mutual interest except in the broadest outlines of the action, which normally preclude violence, but when the police allow protesters to be strapped up and heavily armed, how could they believe a word from such organizers and not be totally prepared for the worst case, which will now be defined for quite sometime by Charlottesville. Please enjoy Six Blocks Away by Lucinda Williams. This entry was posted in Ideas and Issues and tagged Charlottesville, police response, White Supremacists by Wade. Bookmark the permalink.